By 1900, Japanese immigrant families began to establish permanent homes, primarily in Morgan Hill, Gilroy, Watsonville, Salinas, Monterey, Mountain View, Sunnyvale, Milpitas, and San Jose. Many of the Issei (first generation) adapted intensive farming techniques, where high yields were achieved by creating the best conditions possible in a limited space. Their considerable success led to hostility, which contributed to the passage of the Alien Land Act in 1913 (preventing ownership of land by aliens ineligible for citizenship). Read more about the life of a Japanese American farming family in this article, Hard Row to Hoe: Japanese Farming in the Santa Clara Valley. The article, written by Rachael Myrow for KQED's California Report, prominently features JAMsj curator, Jimi Yamaichi. 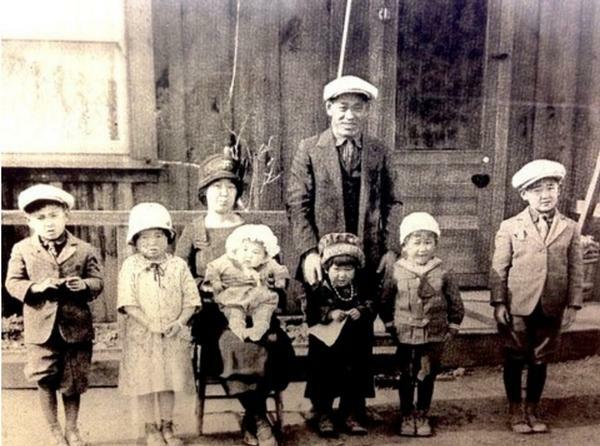 The Yamaichi family of Berryessa, circa 1926. Jimi Yamaichi is second from the right. Courtesy of Jimi Yamaichi. All of the vehicles and most of the farming equipment in the exhibit was donated by JAMsj cofounder, Eiichi Sakauye. The Sakauye family primarily farmed off the Trimble Road area in San Jose (in what was then a part of Alviso). The family still owns a small plot of farmland off of Montague Expressway and Trimble Road, nestled between several high technology companies. Fordson F Tractor. Photo courtesy of Will Kaku. 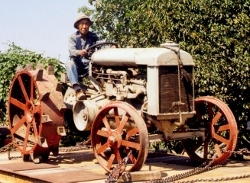 Eiichi Sakauye transports a tractor to the exhibit at JAMsj. Eiichi Sakauye plows the field around Heart Mountain internment camp. International Harvester Kerosene Tractor, circa 1915. The International Harvester Kerosene Tractor was produced between 1906 and 1922. Built out of Chicago, Illinois this tractor was known for its strength and reliability. A predecessor of the modern diesel engine, it used an advanced overhead valve four-cylinder unit with a separate channel frame and chain drive. This tractor was a much more advanced design than other Internationals of the time. A unique aspect of this tractor was a radiator fan behind the engine, which could be switched to help the operator stay warm during winter. 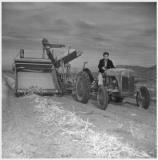 One of the first scaled down tractors of the time it was made mainly for farmers in the Midwest for wheat harvesting. Republic Motor Truck, circa 1913-1929. 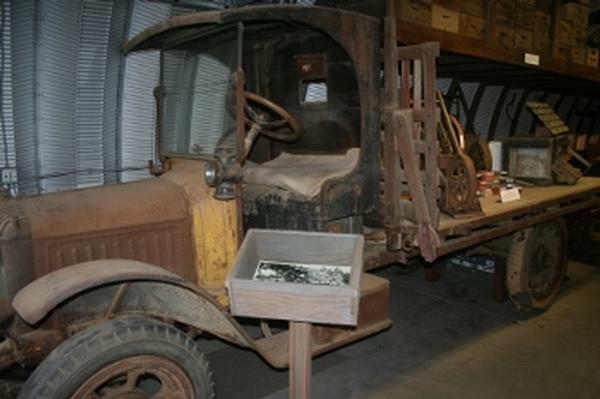 Primarily set up for the “big farm”, the Republic Motor Truck was an extremely useful vehicle to many farmers. Considered a true workhorse, this truck could be set up in a number of different configurations making it widely popular. Known for its modularity it could be changed around to fit a particular farmer’s needs. This truck was revered for its power, capacity, strength and speed. Originally sold with hard solid rubber tires, many owners began to switch to pneumatic tires (balloon tires) around 1917. Because the solid rubber tires where a detriment to the dirt roads at the time the government began to charge a cheaper registration rate if the truck was equipped with pneumatic tires. These tires were easier on the roads but the downside was that the truck could not carry as much weight.